Visual information obtained through the eyes is transmitted energetically to the brain via the nervous system and cellular communication. This same process occurs within the body. Information concerning functioning within the body systems is obtained and transmitted through the nervous system, hormones, ligands, and neurotransmitters to the brain and other cells in the body. The eyes are linked to the inner body by way of the optical nerves, as well as; the cells. 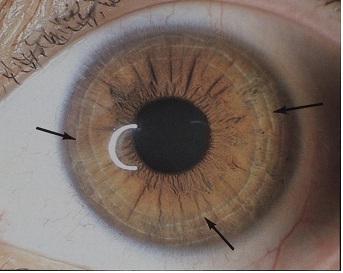 In Iridology, the iris of the eye becomes the visual monitor on which information concerning the activity of the tissues is recorded. With Iridology, information can be obtained through the observation of markings, coloration’s, and fiber patterns, which the Iridologist notes on an eye chart that represents the various systems and organs of the body. The markings and patterns will help the Iridologist determine tissue activity and function in terms of over activity and under activity. The actual colors of the eye can give a wealth of information to the observant iridologist. Eyes are genetically either blue or brown so any variations on that indicate malfunctions. The degree of variation marks the degree of malfunction. For instance, white means an area is working hard to stay even. Yellow-White means it’s losing the battle. Reddish Brown to Brown means the area is deteriorating. If it progresses to black, you have dying tissue. One thing about Iridology, it gives you a chance to know about it before it gets to the point where it has to be cut out. As the body gives up, the yellow-white shows a deeper layer of fibers. Brown indicates the problem has sunk into even deeper tissue and black is a sign of despair within the tissues. One of the most common is Radii Solaris. These are like spokes in a wheel spearing out from the intestines to any area on the map. Wherever they go, they poison and inhibit the surrounding cells. The ancient Chaldeans first recorded this phenomenon 2,000 + years ago in sheep. They knew when they saw them that the sheep needed a parasite cleanse. The results to the areas include inflammation, infection & pain but no medical reason will ever show up. That’s because the area is simply absorbing toxins by osmosis from the bowel. Clean the bowel and cleanse the parasites and you’ll often be amazed at the increased energy and decreased pain and susceptibility to infection you will enjoy. The Lymphatic Rosary is a ring of small beads circling the iris when complete. The lymph is not being able to do its job of waste-removal in the lymphatic system. Wherever you see these beads, you may see signs of swelling or pain. You may also note that perspiration is offensive, skin blotchy and breath is unbearable to those around you. This particular problem is seen most often in people who don’t get enough exercise to properly “pump” the lymphatic system. 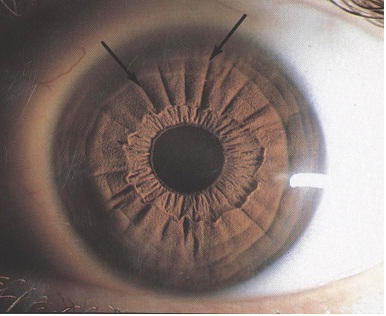 Nerve Rings are circles or arcs of circles looking as though they were embossed into the fibers of the iris. The more of these, the more nervous they are. When they completely circle the eye, the nervous system is just about to crack. 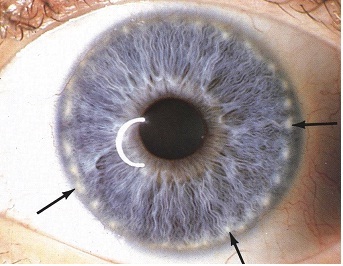 Psoric Spots are often inherited spots which are different from other spots you may see in the eye. They actually seem to float over the surface of the eye and are more a collection of dots than a single spot. Again, cleanse the organs and glands that cleanse the body. Your liver and gallbladder top that list. Intestines, pancreas and spleen follow closely behind.